100% digital 2-way communication utilizing frequency hopping digital spread spectrum (FHDSS) technology. 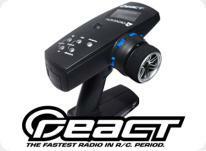 The fastest reacting R/C radio there is, Period. Nomadio Voltage Sensor. Fits on the battery of the car to tell voltage. Recall. Will ship to you from Nomadio. Check this out! New for the Nomadio React. Fits React Perfectly. If purchased will come installed in your car or truck.